Three Private Dining Rooms that seat up to 20, 40 and 55 persons. Duneland Beach Inn circa 1922, located one hour from Chicago in Northwest Indiana, welcomes you to enjoy Contemporary American Cuisine made from the freshest ingredients available. 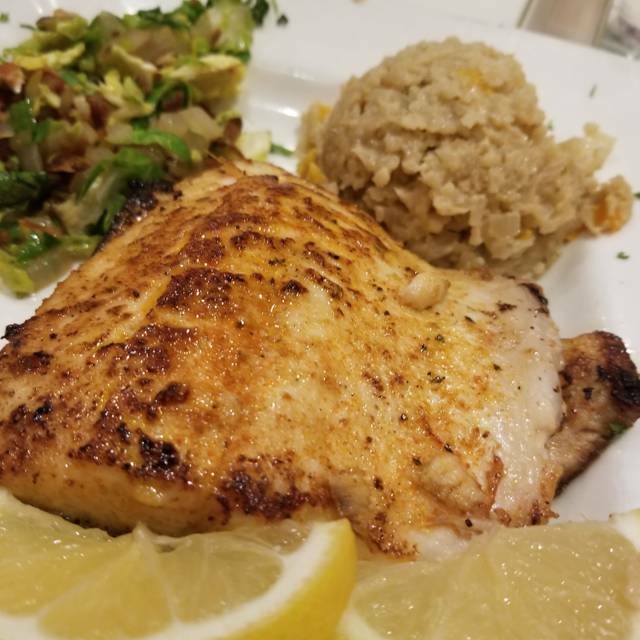 A favorite of locals and Chicagoans alike, the Duneland has become a destination for a memorable dinner serving steaks, exotic fish and fresh seafood. Our menu offerings are seasonal and produced from local ingredients whenever possible. Come in for an iced layer martini in our cozy lounge, then retire to dinner beside one of the fireplaces, or weather permitting,have dinner with friends on the patio. Fine dining in a casual atmosphere at it's best. We were the only ones in the restaurant, and it still took quite a while to get our food which was a very simple rice cauliflower and seafood on tray. The shrimp and crab were ok, but the scallops were chewy and not very edible. We are regular customers and we noticed that our service was a little slower than usual. We were not in a hurry, but there were long periods of time, before we received service and in between servings. Nor were we offered desert. I absolutely love this place, everybody was so nice and friendly! Waitress was amazing, he took care of a party of 13 with no assistance! Great job Shaq!!! The dining room was cute. The food was good . Though the dining room did not appear to be full, it was a long wait for first course. We asked for more rolls 3 times but never got them . Even though they were unexpectedly short-staffed on Valentine’s, the night was flawless. Seated, served, and enjoyed an excellent Beef Wellington, very very good Filets, and interesting and delicious baked deviled egg appetizer. Fireplace was blazing, they had a good crowd but noise level was soft. The entire staff did double duty to perfection. We had a fabulous dinner!! Went for Valentine’s Day. It’s a warm, cozy dining experience. We sat next to the fireplace.The service is excellent, the wait staff is very attentive. I had Lobster ravioli, it was good, but I have had better. 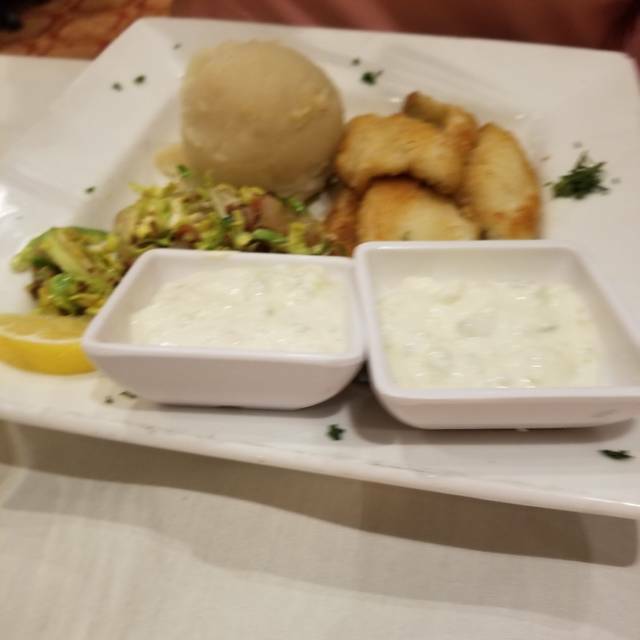 My husband had Lake Perch and said it was great. If you decide to have a drink after dinner go sit in the bar. It’s got a great vibe. Comfy chairs, mood lighting and yummy drinks. This is one of our favorite places. This restaurant provide great food and unmatched atmosphere and service. Simply the best restaurant in town. This is a hidden gem. It is located at a bed and breakfast, Duneland Inn. We had a shrimp appetizer which was fantastic. And the homemade onion soup was perfect with the amount of cheese and onions and croutons. I chose a seafood and veggie combo bowl. It with with riced cauliflower and had scallops, shrimp and crab. The taste was excellent with nice lightly crisp vegetables included. My friend had salmon and veggies as it normally comes with a starch. The salmon had very good taste. She ordered it medium and it came medium well if not well in the thinner parts of the filet. For dessert we had a brownie and ice cream mix which was good. We don't believe the brownie was homemade. Just a heads up to any diners that if you make any changes such as veggies instead of potato there is an up charge. I also noticed quite a up charge for 3 more oz of wine for a 9 oz glass instead of a 6 oz glass. I reminded myself that this is a restaurant at a B & B and they have to support the top quality food they are serving. Service was great. We ate at the bar and had great conversation with Chelle who runs the bar. Please visit as it is well worth it! The kitchen is consistently producing sophisticated dishes that are simply delicious. No matter what season, no matter how slow the attendance, the dishes you request from the menu are available and produced with culinary arts. Couple that with the most gracious hostess in a warm and inviting surrounding with fireplaces Burning bright on a winters night and it had all the makings of a wonderful evening for my wife and myself. First time there. Prime Rib was not tender and under cooked when asked for medium. Lake Perch was a bit soft and mushy. Sides and drinks were fine. Great staff and food. Had a loud couple near us, but they left thankfully. Highly recommend, well worth the drive. Everyone's plate was excellent. Frequent travelers, and permanent foodies are we. Opening up my trusty OpenTable app I selected this particular venue. The menu helped make my decision easy to reserve. Upon arrival the cozy placement warmed the snow sprinkled Haven. Entering the door was a portal to a warming setting, fireplace going, candles lit.... Made the anticipation welcomed. We ordered the Canadian fish and yellow lake perch. Both beautifully done. And the sassy shrimp for appetizer. A must try for seafood lovers. Our waitress was friendly and very pleasant. Can't wait to visit in another season. I have been going to Duneland Beach Inn since the 1970’s. Various owners through the years have different cuisine and a different goal and level of ambition to the restaurant part of the Inn. Currently, the menu descriptions are better than what is actually served. The quality and expertise in preparation of the food is excellent, but presentation needs to be refined and made sure of that all kitchen and bar staff are successfully reproducing the drink or dish in the manor intended and described. Our appetizer was not at all as described, and the sauce it was to come with was forgotten, and we had to argue with the waiter that the dish was described as coming with a sauce. The specialty cocktails were - while strong- did not taste like their description and all garnishes were forgotten- so, again, presentation was poor. The service, while friendly, was strangely inattentive especially considering our group of 8 were the only people in the restaurant for the majority of the evening. The bread and butter was not brought until we finally asked, and water refills were few and far between. We received ‘doggy bags’ when unexpectedly we had to leave early, and the waiter placed one of the bags on the floor even other table was open enough to set it there. Although the food itself was in boxes and bags, it still seemed poor hygiene to place the plastic bags full of food on the floor. We are very grateful to the Inn for the gift certificate given to my boyfriend, whose birthday dinner it was. The atmosphere and history of the Inn, and the overall quality of the food make the Inn worth continuing to support, but I would encourage the owners and management to invest in the training and support of their staff to enable them to provide an exceptional level of service and attention to detail in the presentation and preparation of the Inn’s food and drink. I believe the Duneland Beach Inn is capable of achieving the promise it’s menu and website imply. Very pleasant and we had great meals and drinks. Unfortunately we had a horrible dinner last night. The place is a wonderful venue all seasons of the year and we have enjoyed many fine meals there in our 15 years in the area. That does not make up for the terrible food we had last night. We ordered the fish and chips from the Friday night two entree’s for one price of $26. Great value on paper, but the fish and chips were largely greasy globs of batter, deep fried and saturated in oil. The fish was sparse and difficult to find among the batter. On a positive note, our server was very good and the salad was enjoyable. We know they can do better and our friend’s meals at least looked better than ours. Quaint restaurant with a nice menu. Excellent food although one dinner arrived cold. The rest of he food was excellent! Very friendly staff. The food was fabulous!! Definitely will go again!! Excellent service and attention to all the details! Food quality was exceptional. The 4 of us had a perfect evening! A little oasis in a sea of mediocrity. Great Crab Cakes, great service, nice pours on the drinks. Nice wines. This place could make it in any big city with their quality across the board. We love this gem of a place!! Always cozy, they seated us by a fireplace . Spinach salad is great and our entrees were also excellent. They make you feel at home there. Birthday dinner, but restaurant was not made aware. Duneland is a great place to bring your family for dinner or just a date. The service , atmosphere and food quality have never disappointed me in the 5 years I have been going to this place. The owners and staff truly want the customer to have a great experience. Give this place a shot. Everything was excellent, our server Seth couldn't have been any better!! Can't wait to go back!! This restaurant is my favorite restaurant , a best in class, great food, great service and worth the drive if you are a foodlover. Service was slow since it was a ND football game weekend but some great seasonal entrees worst waiting for. You don’t have to have find any other good reason to go to this restaurant, simply the best food and service in the area. That is good enough reason for me. Thanks for great service and food. We went to the restaurant in Michigan City, IN to celebrate our wedding anniversary. The waiter, Shaq, was very courteous and polite and was helpful with our selections. We found an ad for this restaurant in the local magazine and thought that it would be worth trying due to its local setting and off the beaten path. We were pleasantly surprised. 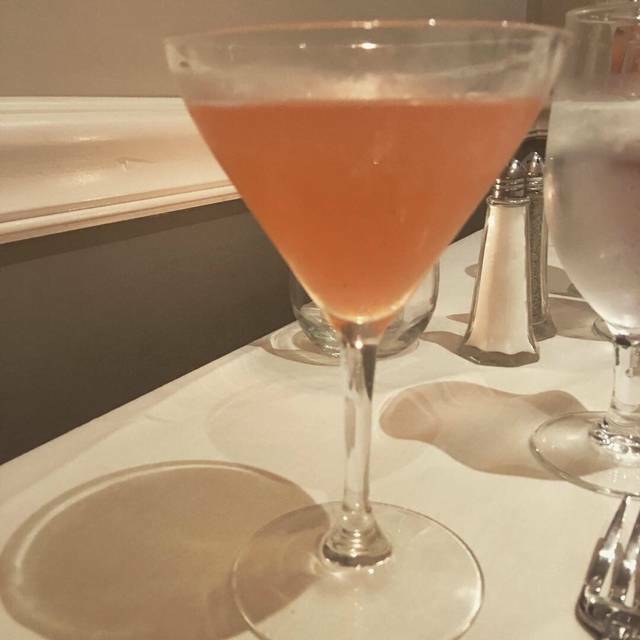 I had a Beefeater Martini and my spouse had one of their signature cocktails. Excellent! We received some Bread and butter to start the meal. We ordered their Calamari and side salad, Baked Whitefish with Mashed potato and vegetables and a Hamburger with fries as our entrée. For dessert, we had one Chocolate Chip Cookie with Ice Cream. Delicious! Had to take a doggie Bag. Restaurant is worth going to, even though it is a little pricey. $$. Good quality costs! We will return on our next trip to New Buffalo, MI. Great dinner, great great great service. We enjoyed the ambiance. We frequent Duneland Beach Inn and really like it! It’s a beautiful Inn in the woods with a cozy dining room, bar, and has nice outdoor seating. The service this time was wonderful! The only small issue I had was that my salmon was over cooked. They offered to remake it, but due to timing I did not take them up on the offer. It’s a place that takes some time, so if you’re looking for a quick in/out, this is not the spot. It’s definitely worth checking out! This restaurant is neighborhood gem, unmatched service and food. The best restaurant around the area. If you like to have great time, want to impress someone then this is the place to go. The menu did not state there were no shrimp in the pasta dish. My steak was under cooked, the two sides, potatoes & greens, were awful. Will not be coming back. Duneland Beach Inn is a favorite to go to with a group (we were 7) because it is quiet enough to hold a conversation with everyone. The ambience is very comfortable but not too casual--perfect for special occasions. The food is good, sometimes great--their ahi tuna appetizer is fantastic, and a great value as well--but sometimes other items fall short. But the food is not the issue. The service leaves much to be desired. We had changed the number in our party that afternoon, calling in and being assured it was no problem, but when we got there, it seemed no one knew, and we had to wait while tables were put together. There was no "Greeter" type person who welcomed us and made us feel they were happy we were there. Though the restaurant was not crowded (even though it was Saturday night), it was 15 minutes at least before we got the wine we ordered, and similar delays for other courses. No one came around to check that our water needed refilling or any other need, even though there were employees resetting tables for the following day, when they could (and should) have been seeing to the current guests! Very good food, great service! We had dinner with our visiting family from NY, they and we had great time, great service by waitress Leigh, great food and even owner visited severa times. Even our family from NY gave themselves way UP for atmosphere, service and food. Thanks for great service and great food. This is the best restaurant in town period. Awful awful. Terrible service and waited over an hour for food.